Nestled in the Smoky Mountains of eastern Tennessee, the town of Johnson City had always seemed exempt from the anxieties of modern American life. But on August 11, 1985, the local hospital treated its first AIDS patient, and, before long, a crisis that had once seemed an “urban problem” had arrived in the town to stay. Working in Johnson City was Abraham Verghese, a young Indian doctor specializing in infectious diseases. Of necessity, he became the local AIDS expert, soon besieged by a shocking number of male and female patients whose stories come to occupy his mind, and even take over his life. 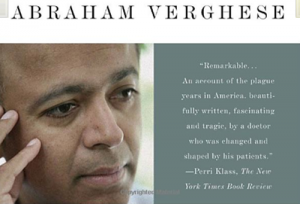 Verghese brought a singular perspective to Johnson City: as a doctor unique in his abilities; as an outsider who could talk to people suspicious of local practitioners; above all, as a writer of grace and compassion who saw that what was happening in this conservative community was both a medical and a spiritual emergency.